HYDERABAD, Jul 13 (APP):The Chief Secretary (CS) Sindh Maj (r) Azam Suleman Friday directed all the district administration to ensure complete implementation on the Election Commission of Pakistan’s (ECP) code of conduct. 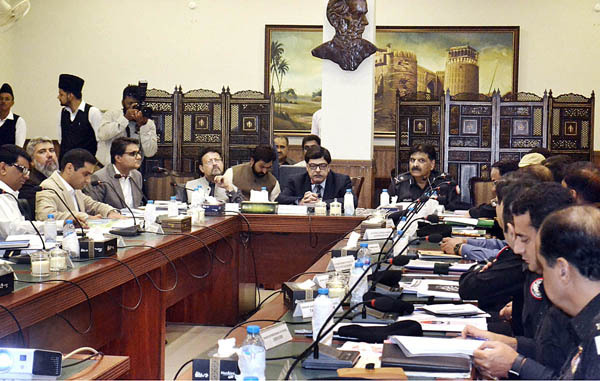 The CS was chairing a meeting in this regard here on Friday that was attended by IG Sindh Police Amjad Javed Saleemi, home secretary Haroon Ahmed Khan, Regional Election Commissioner Hyderabad Aijaz Anwar Chohan, Commissioner Hyderabad and DIG Hyderabad, among other officials. Azam Suleman also directed the officials to figure out how many polling stations still lacked the required facilities so that the same could be made available ahead of the polling day. He said the power generators and UPS should be provided at the polling stations and that the officials should coordinate with the distribution companies to get restored the electric supply to the stations whose power supply had been disconnected. “This should be necessarily done so that the CCTV cameras could be installed at the stations,” he said. “Maintaining law and order during the elections is a challenge for us and for this purpose we have been posted on our positions. Therefore, it is incumbent on us to make the elections free, fair and transparent,” the CS observed. Suleman also asked the officials to ensure that drinking water was supplied at the polling stations and availability of toilets. CS in view of the upcoming monsoon rains instructed for necessary arrangements to ensure that the polling process was not affected. IG Sindh Saleemi directed DIG Hyderabad to ensure security of the election candidates as well as the general public. “The police should also keep a watch on the candidates and the people violating the ECP’s code of conduct,” he directed. He also asked the police officials to maintain a liaison with all the law enforcement agencies.At the meeting, the Deputy Commissioners and the SSPs of all the 9 districts in Hyderabad division separately briefed the CS about the arrangements.